The Global Volcanism Program has no activity reports for Chaîne des Puys. The Global Volcanism Program has no Weekly Reports available for Chaîne des Puys. The Global Volcanism Program has no Bulletin Reports available for Chaîne des Puys. The Chaîne des Puys, prominent in the history of volcanology, form a N-S-trending chain of basaltic and trachytic cinder cones, basaltic maars, and trachytic lava domes in France's Massif Central that has been active into the Holocene. Construction of the present-day Chaîne des Puys began about 70,000 years before present (BP), and was largely completed by the beginning of the Holocene. 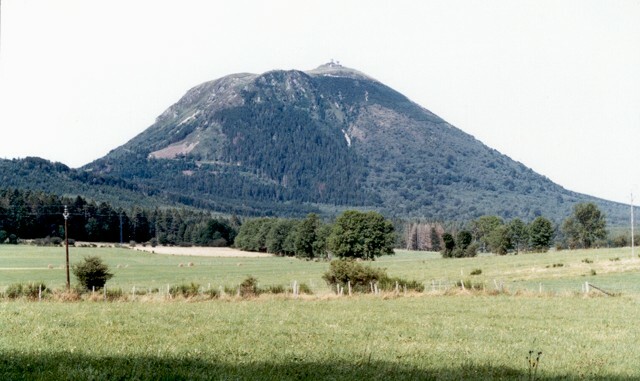 Holocene eruptions constructed lava domes such as the Puy de Dôme, whose growth was accompanied by pyroclastic flows, cinder cones that fed lengthy lava flows, and maars. The latest well-documented activity took place about 6000 BP near Besse-en-Chandesse and included the powerful explosions that formed the Lac Pavin maar. The dating of younger tephras has not yet been confirmed, and reports of historical eruptions as late as 1000 BP have been discredited. This volcano is located within the Chaîne des Puys Limagne Fault Tectonic Arena, a UNESCO World Heritage property. Brousse R, 1973. Le volcanisme Quaternaire en France-chronologie des differentes phase eruptives de la Chaine des Puys au Quaternaire recent. Internatl Quat Assoc (INQUA) Cong, 9: 105-109.
de Goer A, Boivin P, Camus G, Gourgaud A, Kieffer G, Mergoil J, Vincent P M, 1991. Volcanologie de la Chaine des Puys. Paris: Inst Geog Natl, 127 p and 1:25,000 geol map. Geunet P, 1986. Datation par l'analyse pollinique de l'explosion des volcans du groupe Pavin (Besse-en-Chandesse, Puy-de-Dome, France). 11 Reun Ann Sci Terre, Clermont-Ferrand, Ed Soc Geol France, p 85. Guerin G, 1989. La thermoluminescence des plagioclases, methode de datation du volcanisme. Application au domaine volcanique Francais: Chaine des Puys, Monts-Dore, Cezallier, Bas-Vivarais. Unpublished PhD thesis, Univ Pierre et Marie Curie, 253 p.
Hetier J M, Guillet B, Brousse R, Delibrias G, Maury R C, 1983. 14-C dating of buried soils in the volcanic Chaine des Puys (France). Bull Volcanol, 46: 193-202. Juvigne E, Bastin B, Beaulieu J L de, Etlicher M, Gewelt M, Gilot E, Goeury C, Janssen C R, Milcamps V, Van Leeuwen J, 1990. Tephrostratigraphy of the late glacial and the Holocene of the French Massif Central based on investigations in peat-bogs. IAVCEI 1990 Internatl Volc Cong, Mainz, Abs, (unpaginated). Krafft M, 1974. Guide des Volcans d'Europe. Neuchatel: Delachaux & Niestle, 412 p.
Pelletier H, Delibrias G, Labeyrie J, Perquis M T, Rudel A, 1959. Mesure de l'age d'une des coulees volcaniques issues du Puy de la Vache (Puy de Dome) par la methode du carbone 14. CR Acad Sci Paris, Series-D, 214: 2221. Rutten M G, 1969. The Geology of Western Europe. Amsterdam: Elsevier, 520 p.
There is no Deformation History data available for Chaîne des Puys. There is no Emissions History data available for Chaîne des Puys. The Chaîne des Puys form a N-S-trending chain of cinder cones, maars, and lava domes in the Auvergne region of France. 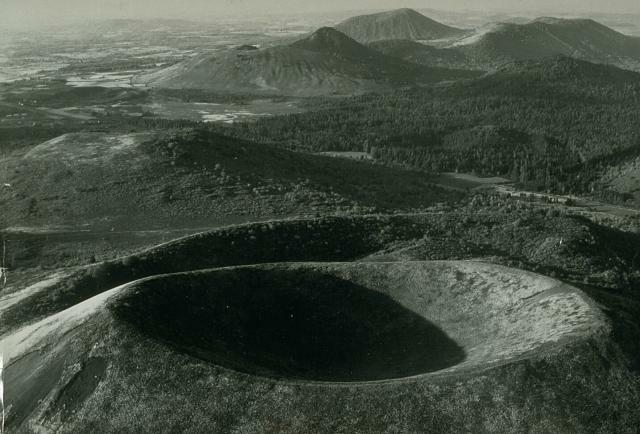 The Puy de Pariou crater in the foreground is a cinder cone that grew about 8200 years ago within an earlier tuff ring, whose rim appears immediately behind Pariou crater. A lava flow from Puy de Pariou traveled 8 km west to near the edge of the present-day city of Clermont-Ferrand. The sharper peak in the background is Puy de Chopine, whose complex history ended with domal uplift. Photo by Loïc Jahan (Parc de Volcans, published in Green and Short, 1971). The southern flanks of 1464-m-high Puy de Dôme, the highest peak of the Chaîne des Puys volcanic chain, rise above farmlands. Puy de Dôme originated during a series of eruptions about 10,000 years ago. Explosive destruction of the eastern side (right) of a massive lava dome was followed by growth of a second dome. Crumbling of a spine capping the second dome formed the low mound of breccia at the summit of Puy de Dôme, which has been covered by a pyroclastic-flow deposit from nearby Killian volcano. 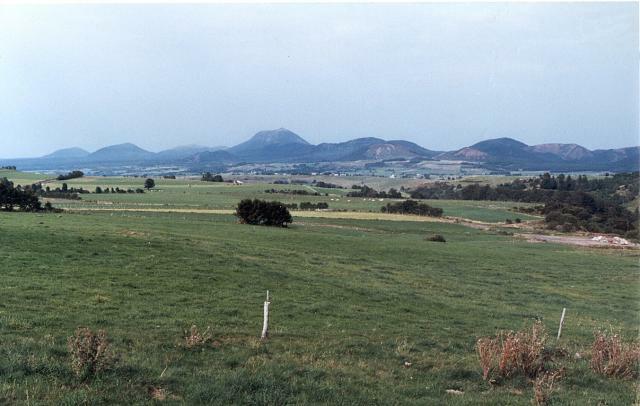 The central part of the Chaîne des Puys volcanic chain in the Auvergne region of France is seen from the SW. Puy de Dôme is the rounded peak in the center, Puy de Côme is at the left, and Puy de Laschamp is the scoria cone at the right. The N-S-trending chain of basaltic and trachytic cinder cones, basaltic maars, and trachytic lava domes in France's Massif Central has been active into the Holocene. The latest well-documented activity took place about 6000 years ago. Large Eruptions of Chaîne des Puys Information about large Quaternary eruptions (VEI >= 4) is cataloged in the Large Magnitude Explosive Volcanic Eruptions (LaMEVE) database of the Volcano Global Risk Identification and Analysis Project (VOGRIPA).